Lorena, S. Y. 1,398 tons. Mr. A. L. Barber. apprentice, and served till 1881, when he joined Messrs. Kitson. In 1884 he became a partner in the firm of Messrs. Clarke, Chapman and Co., of Gateshead-on-Tyne, and it was here that he commenced to bring his idea of the turbine engine into practice. He devoted his whole energy to the subject, and in a few years had so far perfected it that its adoption is becoming general. The greater part of the development was carried out at his Heaton Works at Newcastle, and at the Parsons Marine Steam Turbine Co.’s Works at Wallsend-on-Tyne, where the turbine machinery of the Turbinia, Virginian, and all the turbine yachts has been constructed, as well as all the turbine machinery for the war-ships at present in commission. 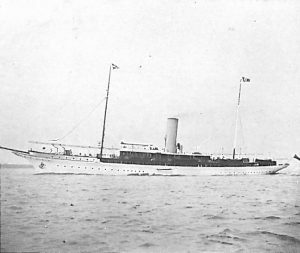 The first steam yacht ordered to be fitted with steam turbines was Sir Christopher Furness’s Emerald, followed by Mr. A. L. Barber’s Lorena, and later by Colonel H. L. B. McCalmont’s Tarantula.